Private equity investor EmergeVest has merged six companies to create a logistics and technology-based company, EV Cargo. EV Cargo chief executive, Heath Zarin. The companies consolidated include logistics specialists: Adjuno, Allport Cargo Services, CM Downton, Jigsaw, NFT and Palletforce into a corporate structure under a new single brand worth £850 million. Each business will retain its own identity. EV Cargo will maximise opportunities for, sustainability, efficiency and growth across existing and new markets. “We are excited to announce the creation of EV Cargo, bringing together our UK logistics and technology platform into a unified £850 million corporate structure. 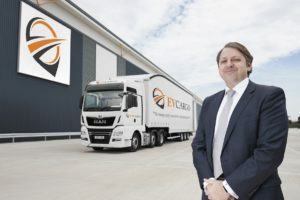 EV Cargo will continue our existing strategy of delivering mission-critical supply chain services powered by people, technology, innovation and sustainability,” said EV Cargo chief executive Heath Zarin.